Last summer, I got monstrously drunk at Pride, went back to my friend's apartment, and passed out on her couch (if you follow me on Twitter, behold my profile pic). When I woke up and felt disgusting, she suggested we watch a movie, and AS LUCK WOULD HAVE IT, the HBO adaptation of Behind the Candelabra: My Life With Liberace was on On Demand, and I had JUST seen Patton Oswalt giving it rave reviews. I got through like an hour before passing out again, and when I woke up, everything had gone to hell and Matt Damon was strutting around in furs, yelling at Michael Douglas. Needless to say, I was totally on board to read the super-short book this thing was based on. So obviously the main problem with reading one person's side of a relationship is it's never accurate. You don't know what the other person was thinking all the time. You're hurt, because it's over and you had FEELINGS wrapped up in it, which cloud your judgment. And there was a giant lawsuit that the author, Scott Thorson, had had against Liberace, so that complicates the truth further, because what if to gain his point in court he had slightly stretched/bent the truth? You can't go back on that now in your tell-all book published the year after Liberace died (1988). Some of the reviews on Amazon were along the lines of "I WANTED MORE SEXYTIME GOSSIP," but as I went into it SOLELY knowing that Liberace was gay and sometimes played by Michael Douglas, I found the entire book fascinating. And I believe Scott's background, at least. And why he, as an 18-year-old boy would take up with a 58-year-old. Scott was in foster care, shuttled from home to home, and according to him, Liberace was the first person to tell him he loved him. At first I was like "Bullsh--" then I thought about it, and that could absolutely have happened. And does. And omg. 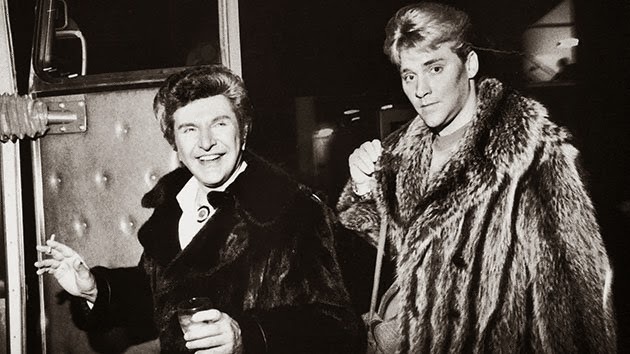 According to Scott, he and Liberace were in a five year relationship that ended because Scott got too old. And also looked liked Liberace, because the latter made him get plastic surgery to make this happen. A lot of the book details all the stuff Liberace had, which was great from a voyeuristic perspective (what? mirrored pianos? get out of town), some background on him (which was great, again, because I knew nothing), and the slow decline of the relationship, which Scott does not excuse himself from. Because of the recentness of the movie, it took a while for me to realize this was written in 1988, which then explained a LOT. Like "Today, because of the AIDS epidemic in Hollywood, employers are reluctant to hire known gays." But theeeen it all made sense. This was only a year after Reagan said the word "AIDS" in public. And in case you were unaware, this is what Liberace died from, which is the especial worst because he spent most of his life defending his staunch heterosexuality. Oops. BUT ANYWAY, it was short, it was entertaining, and I believe like 60% of it. You could probably just watch the movie, though. The parts I was awake for were excellent.